For some reason it seems strange to write about quilting during summertime but here goes. I was supposed to finish this quilt last year. Then I was supposed to finish it in January. Then I got super busy and we went on lots of adventures and the quilt was nearly done but I just couldn’t make myself sit down and hand sew the binding. Last week, I found myself with an evening where I wasn’t exhausted and our plans had been cancelled and finally it was time to finish the darn quilt. I was determined. So much so that I finished sewing it with a headlamp on after Shawn had gone to sleep. It is done! 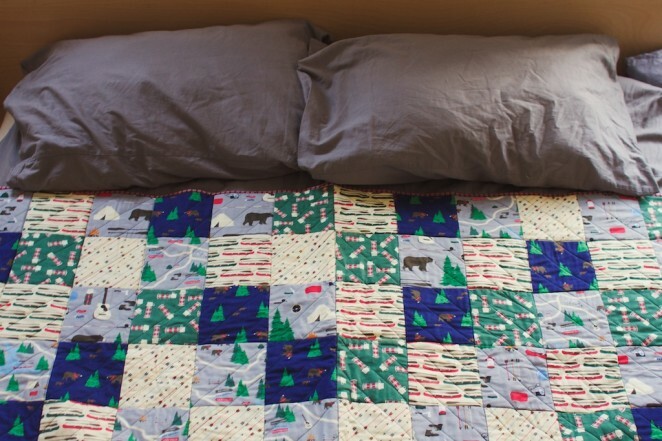 The quilt is a gift for Shawn, as I thought he’d like the outdoor adventure fabrics. It is not really meant for the outdoors, as the backing is a snuggly fleece, but it isn’t necessarily restricted from them. It’s a bit larger than a standard throw blanket, by request of my tall husband. I did all the quilting on his vintage Singer sewing machine, also by request. The binding is hand stitched as I still haven’t figured out how to make a pretty machined binding (passable sure, but not pretty). I’m pretty happy now that it’s complete. 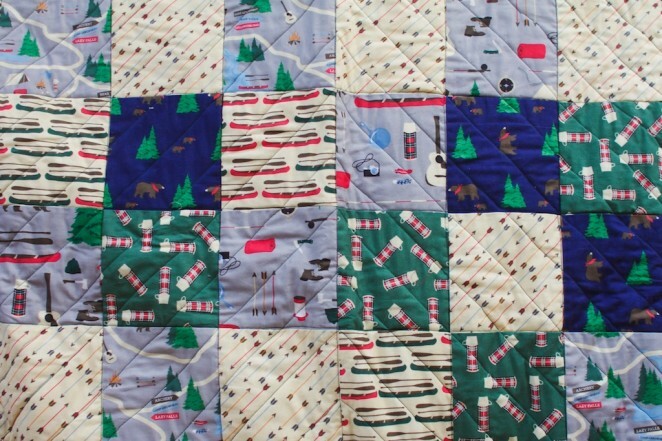 I thought I was sort of done with quilting but I imagine it’s just a summer thing. 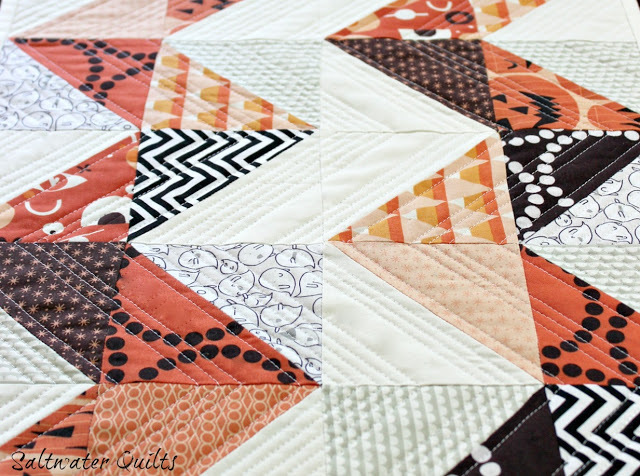 As I write this I am imagining a cute quilt that could go on our spare bed. If only I knew how to make a quilt that repelled cat fur. All through December I sewed and knitted and crocheted a handful of gifts for friends and family in secret. I was so excited to finally get to share some of my creations once the holidays had past. Of course I was so excited to send many of them off, I forgot to take photos. Oops. 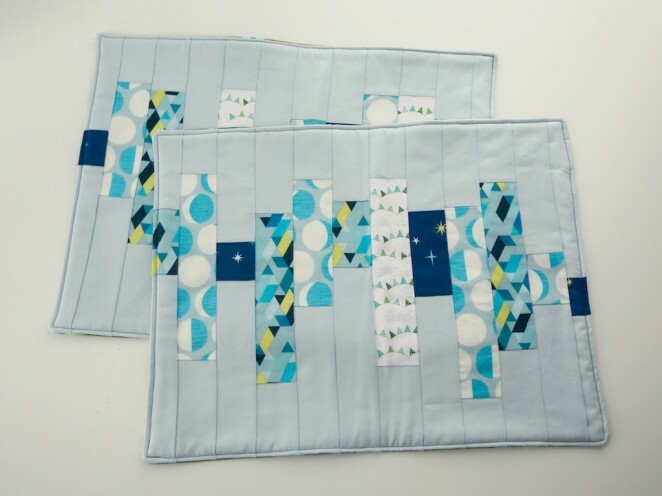 I did remember to snap some photos of these quilted place mats I made before they were wrapped up. I had fun with these, with no specific pattern, just piecing together some fabrics that I liked and using a cool geometric pattern on the back. 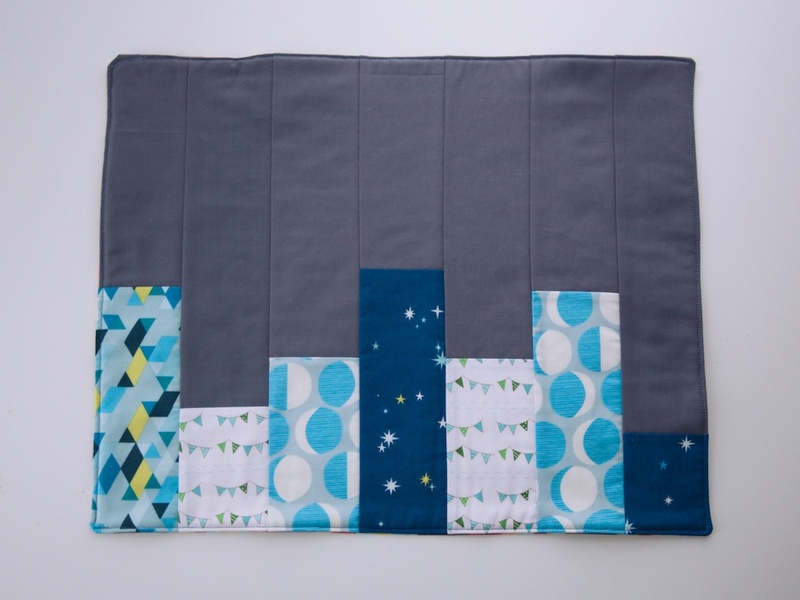 For the second set, I wanted to do something a little different and made a sort of cityscape. I was torn whether to sew in some stars but in the end left the sky blank. I do like the idea of some bright yellow accents though. 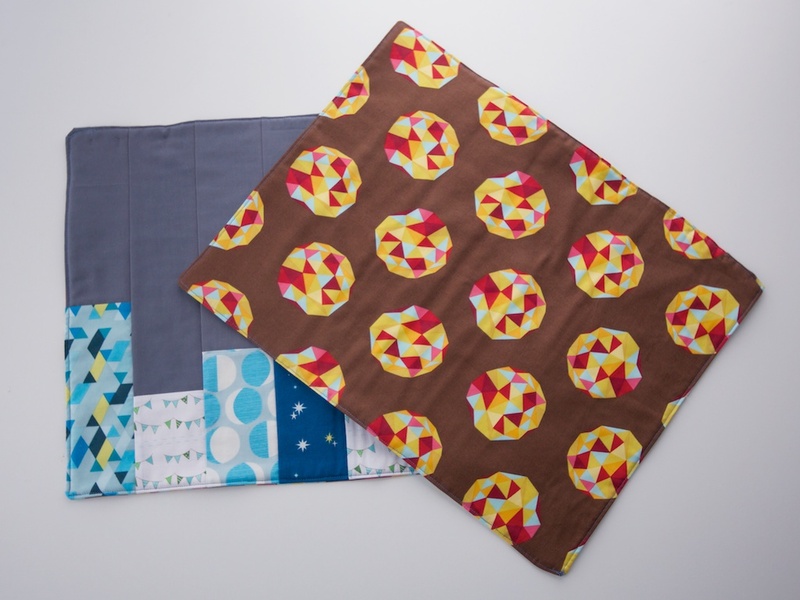 The backing on these is also a fun geometric fabric, though a different colorway. Now that things are a little less hectic I’m looking forward to making some placemats for our home. I think I’ll try a new design with similar colors since I like how these turned out so much. Hello November! I’ve been away from the blog for a bit longer than I like. We had a whirlwind trip this past weekend to visit Shawn’s family and attend his sister, Amy’s, baby shower. 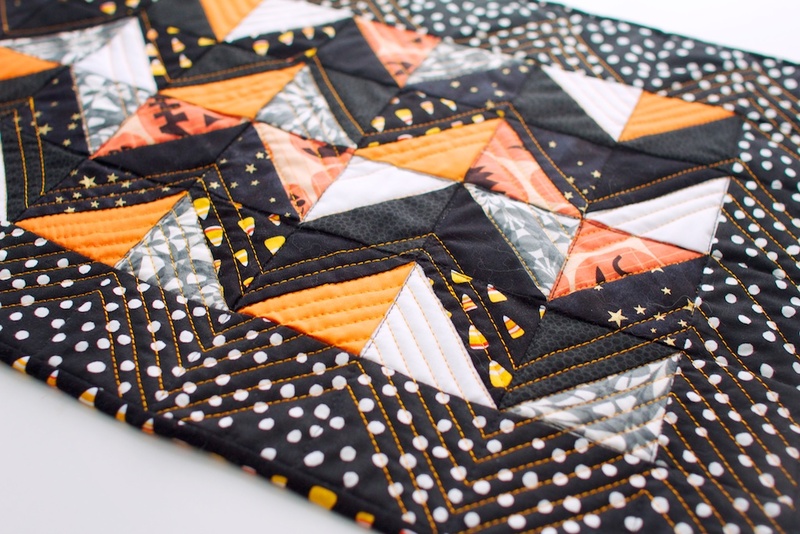 The exciting thing, besides getting to spend some time with family and catch some of the beauty of fall in the East, I finally get to share this quilt. Since it was a gift for the baby, it’s been a secret project while I’ve worked on it for the past few months. 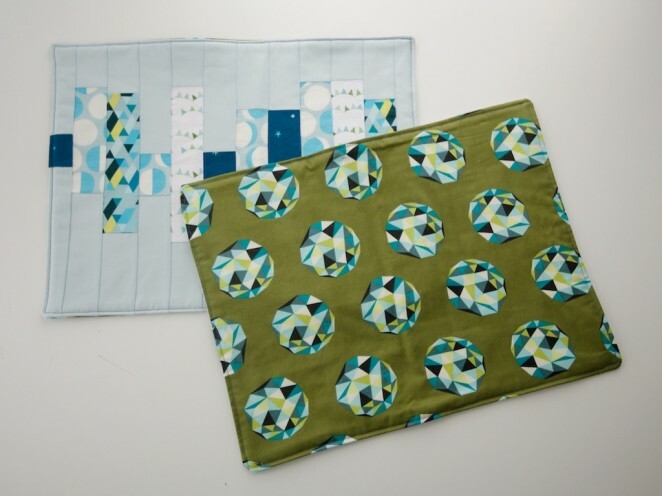 Shawn and I labored over choosing the fabrics and settled on some contrasting colors to go with a cute raccoon print. 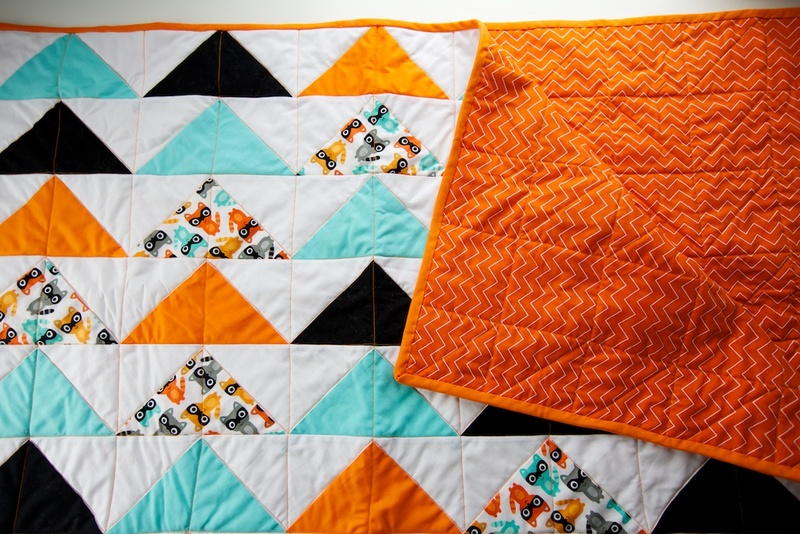 Since it’s a crib sized quilt, it didn’t take terribly long to sew together once all the triangles were cut. I hand bound the edges and actually enjoyed doing it for the first time. 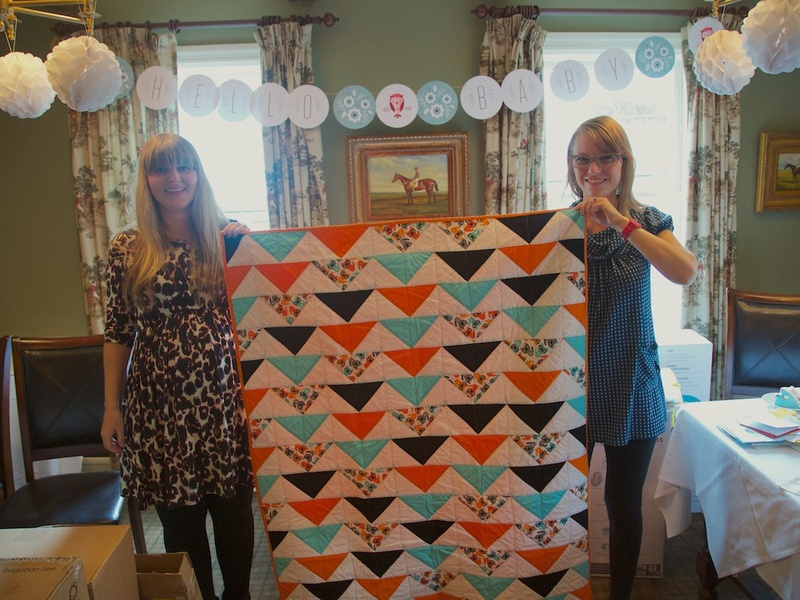 I was really excited to give Amy & Jason the quilt knowing it is something that their baby will have for years to come. 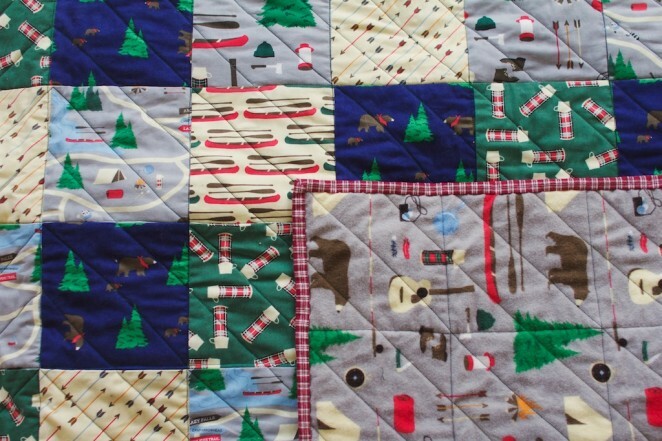 I still have a quilt my great grandmother gave to me for my first birthday and it means a lot to me. 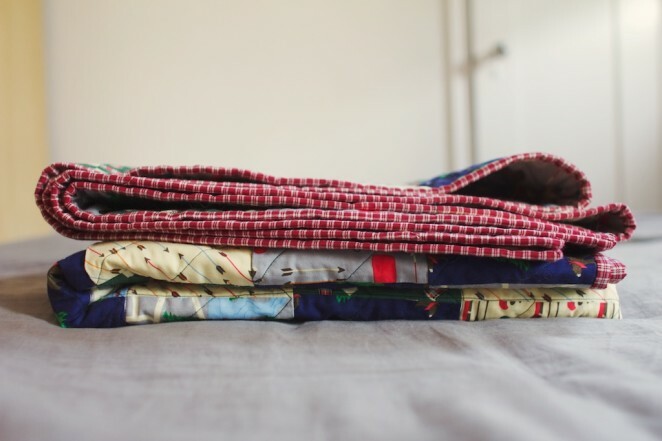 I like to think that I’m carrying on some small tradition of quilt making. I finished this little quilted table piece for Halloween. It’s inspired by the Halloween table runner I found a few weeks ago. I just used some fabric I had saved from last year, and it turned out to be sort of an odd small size, so I added the border. 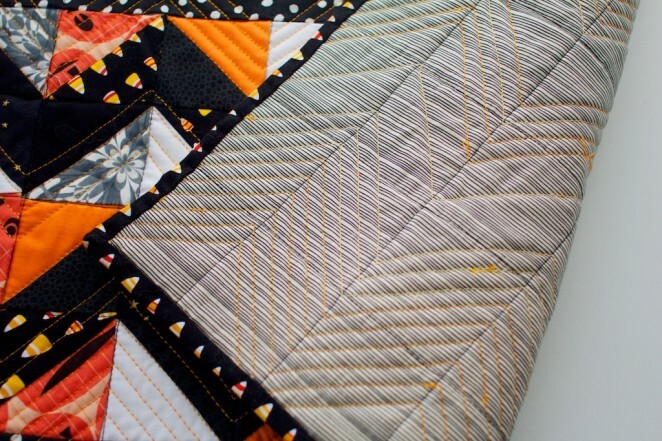 I really enjoyed sewing the chevron stitching and feel like it pulled the whole thing together. This isn’t the the first quilted thing I’ve made without a pattern but it’s one of the more complex things I’ve put together in terms of all the pieces. It it slightly more polished than some of the other things I’ve made in a way. I feel like I’ve turned a corner in quilting from when I had no idea what I was doing to feeling more confident and comfortable with the process. Quilting is one of the few hobbies I’ve picked up as an adult and it’s nice to finally get over being intimidated by various steps. It’s now something I can do somewhat mindlessly while watching old episodes of Buffy the Vampire Slayer. In other news, Shawn had been out of town working for the past month and is finally home. Hooray! We’re starting to get in the fall spirit in earnest now and there will be many more Halloween projects and adventures. So excited! It’s the first week of September, hot as hell, and I’m already starting to plan for Halloween time. I can’t help it, I’m excited. It’s also possible my brain might be melting. Perhaps if I think about cooler times they will arrive. 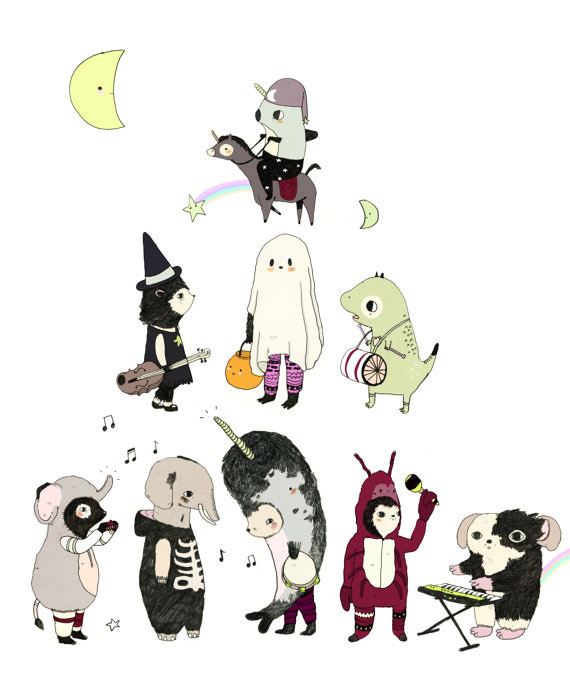 First, I love this Halloween Party print from Julia Pott. She also made one of my favorite short films, BELLY, which I highly recommend you watch. I can’t stop thinking about this Halloween Table Runner from Saltwater Quilts. 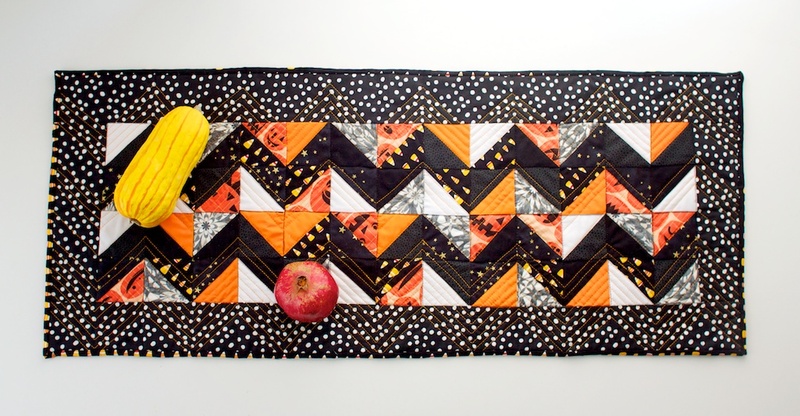 I made this Halloween table cloth last year with some of the same fabrics but I really like the quilted version. Looking forward to going to the fabric store to see what new prints are available this year. 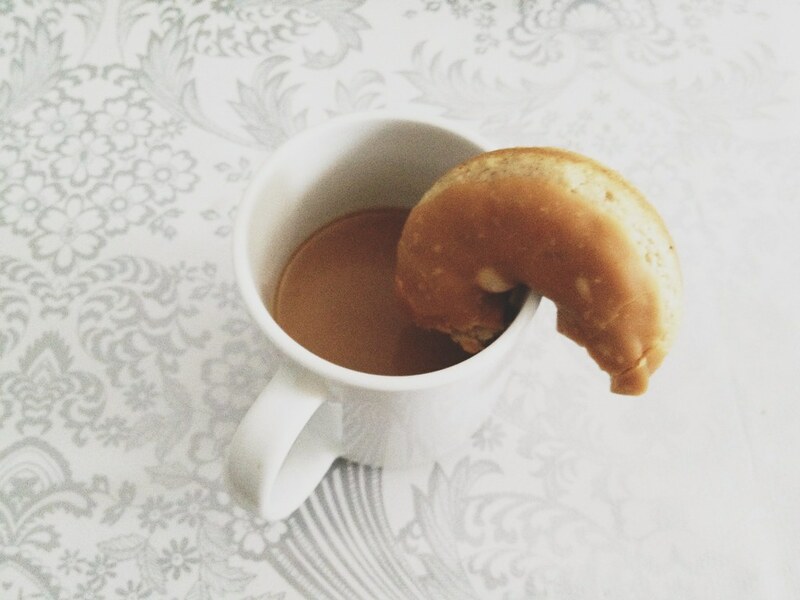 Also I’ve been fiending for an apple donut. What? I don’t even know that I’ve ever had an apple donut but thanks to instagram I’ve seen tons of them and want one for myself. I guess it’s time to get in the kitchen and start testing out some recipes (because it’s obviously a great idea to mess with frying oil when it is a billion degrees out).